The National Team of Georgia U19 qualified to the Euro 2013. In four days the group stage begins. 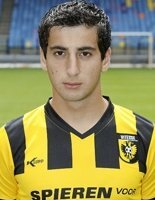 Georgian winger returned to Vitesse Arnhem after spending half of the last season in Russia on loan. The right midfielder will play on loan with German 3. Liga side Hallescher FC. Georgian champions approved the first test. The Georgian champions reinforce the attack signing an Ivorian forward.